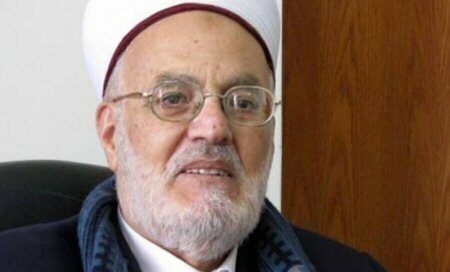 Israeli occupation forces detained, on Tuesday evening, the minister of al-Aqsa Mosque and Grand Mufti of Jerusalem and Palestine, Sheikh Ekrima Sabri, in front of his home in occupied Jerusalem, serving him with an order barring him from travelling abroad. Talab Abu Arar, a member of the Israeli Knesset for the United Arab List, considered it a political persecution against Palestinian symbols and clerics. Abu Arar spurned this action which aims to muzzle Palestinian voices under false pretenses, confirming that the occupation will never break the will of the Palestinian people.